I get a lot of questions about proper screenplay format. So I thought I’d write up a post which can help with the vast majority of these questions. In general, you’re best bet for understanding screenplay formatting is to read a ton of screenplays by professional screenwriters. There are lots of places to find online versions of film scripts. Google “movie title screenplay” and you’ll usually find the exact script you want. There really is no better way to understanding screenplay format than by reading lots of screenplays. Usually the person who asks the screenplay format question will have some strange and obscure formatting issue that they have never seen before. Often times I don’t know the “right” way to format it either. But one thing to keep in mind when trying to figure out how to format your screenplay, above all else, make it easy to read and easy to understand. Never let the formatting get in the way of reading your screenplay. Think about the journey your screenplay is going to take, if you’re lucky, from your computer to the silver screen. 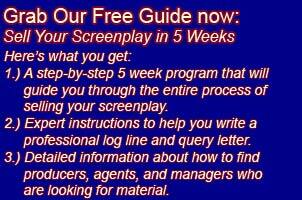 Assuming you can get your screenplay read (read my post How to Sell Your Screenplay to learn more about getting your script read, optioned, and sold) the first people who read your screenplay at an agency or production company are going to be entry level folks who have a lot of other screenplays to read. Even if your story is solid, if your screenplay has a bunch of really clunky formatting that makes the act of reading it hard, you’re seriously jeopardizing your chances that they will recommend your script. Again, I’m talking about general screenplay format, your script has to look like a screenplay or it will never get past those entry level readers. But don’t get hung up over small picky little formatting details for obscure situations. Just tell your story in the simplest easiest to read manner you can think of and you’ll be fine. I also find that many people who are asking about these strange formatting issues simply shouldn’t be including them in their screenplay. Ask yourself, is this direction absolutely necessary to tell my story? If it is, do your best to make it understood. But in most cases you could and should cut these situations out of your story and you’ll be much better off. For many strange formatting situations there probably isn’t a “right” way to do it anyway. There is no official screenplay format council that decides exactly how screenplays should be formatted. There are simply some professional standards which you should follow. If you have a firm grasp on basic screenplay format you should be able to figure something out if you decide your story absolutely can not be told unless you use some bit of strange direction that needs special formatting. I’ve written several posts on various screenplay formatting issues so be sure and check out those posts, too. You can find them all here: Screenplay formatting questions.